Though Facebook tends to be the most popular social media tool when it comes to promoting your fundraising auction, the visual-based Pinterest has three excellent uses. But wait! Here’s a quick lesson in Pinterest, in case you’re unfamiliar with the tool. Pinterest is a social network that allows users to share images and videos. Unlike Facebook, which tends to accommodate lengthier text, Pinterest is designed to mimic a scrapbook filled with photos. Users “pin” photos onto webpages, which are called “boards.” Usually there is a common theme to the photos pinned on a Board. Here are the three best uses I’ve seen for Pinterest when it comes to a fundraising auction. 1. Use Pinterest with your guests to share event attire recommendations. Later this week I’ll be in Tampa, FL working with a new client. They are celebrating an international expansion and are encouraging guests to participate by wearing global attire. 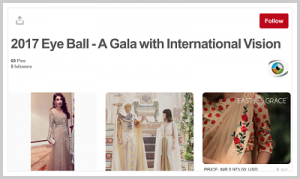 Their Pinterest board has nearly 90 photos on it, showing appropriate gala wear that has a flair reminiscent of India, China, Cuba, Germany, Greece, and dozens of other countries. My client sent guests a link to the Pinterest page when they emailed final instructions a few days before the gala. Regardless of your theme, I think guests appreciate having a visual image of what is appropriate to wear. Some attire suggestions are so vague as to confuse guests (e.g. “art-inspired attire” is one I read). In other cases, you might be changing from a formal to a more-casual event and guests need advice on what “casual” really means at your fundraiser. Rather than email photos of decor ideas to committee members, this nonprofit created a Pinterest Board. It was a central location to post photos for all to see. One of my Ohio clients held their annual convention in Washington, D.C. For the gala, they opted to decorate with cherry blossoms. The decor committee had members across the country, so they found it useful to have the members save (a la, “pin”) photos to a Pinterest Board. It served as a centralized database for decor ideas. Furthermore, this worked much better than emailing bulky photo files to each member of the committee. All team members could to see the photos posted simultaneously, and their centerpieces, table decor, posters, and so forth were designed with the ideas they all shared on the Pinterest board. There’s no shortage of ideas on Pinterest. You can research item donations, view ballroom set-ups, and scope out ideas for centerpieces. One caveat: I’ve seen some bad information on Pinterest, too. A client sent me an image of what was labeled as a “great silent auction bid sheet.” She asked for my opinion. Oh my, the bid sheet was a disaster, filled with misinformation. The image looked nice, but it wasn’t accurate. So just remember: Just because someone posted it on Pinterest doesn’t make it a best practice, but Pinterest does have some stellar uses, too. 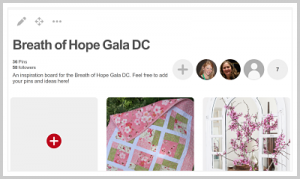 Have you used Pinterest in your fundraising auction to facilitate auction planning? Share below so we all learn.